I bought some Southern Illinois peaches when in Illinois earlier this week, anticipating their juicy deliciousness. I had visions of eating them on cereal, ice cream or possibly making a pie. They were tasty but had a mushy texture, not great for any of those uses. 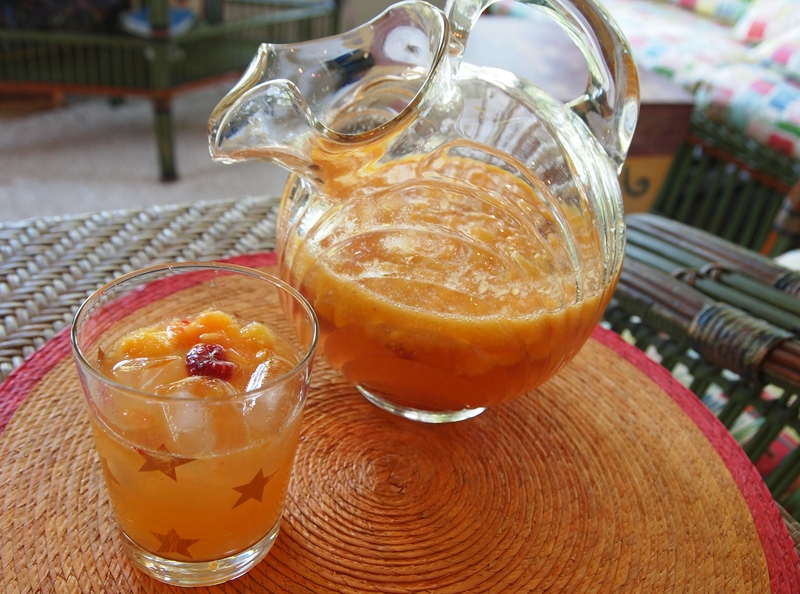 So to make lemonade out of lemons, I remembered this delicious Sangria that I had not made for a few years. It’s the height of peach and raspberry season so this is a perfect recipe for right now! It’s easy to make, light in alcohol and very refreshing. Enjoy on a hot summer afternoon or evening. Placed the diced peaches, raspberries and Cointreau in a pitcher. Let sit 1-3 hours at room temperature. When ready to serve, add the wine and the sparkling water. Pour over ice, adding a little fruit to each glass. Garnish with mint if using. Serve with a spoon for the fruit. NOTES: No need to spend a bunch of money on the wine. You will want a fresh, fruity white. I particularly like Beringer’s Chenin Blanc at about $7.00 per bottle. I’ve also used Pacific Rim Dry Riesling, another reasonably priced white wine, successfully. This year we will have two family gatherings for Thanksgiving. The first is at my brother John’s on the actual day, which is also my birthday (yeah!!). We mostly cooked the traditional family recipes because as in so many families . . . don’t mess with tradition! But we also added a few new things, and everybody attending brought something, so we had a fabulous menu, from turkey to pumpkin pie and everything in-between. One thing stood out this year and that was cranberries. Starting with dried cranberries on the spinach salad and fresh in the apple-cranberry pie with crumble topping, they were a featured ingredient. My sister-in-law, Cindy, and I conspired on two delicious additions that used cranberries. 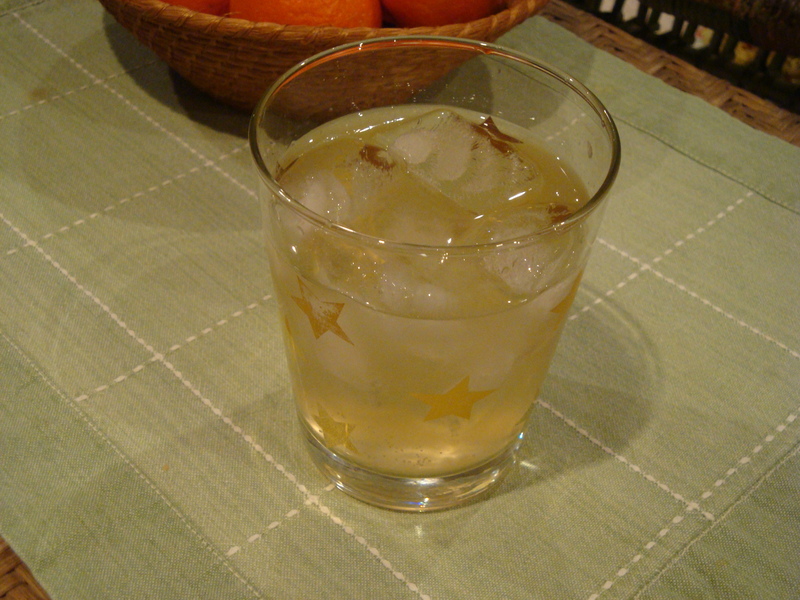 The first was Sparkling Pear Cocktail, which we found in this array of Thanksgiving Cocktails from Martha Stewart. These were a refreshing, low alcohol way to start the festivities. We were also looking for a new and different cranberry sauce, something that would be a departure from the usual. We found this Brandy spiced cranberry sauce from The Galley Gourmet. 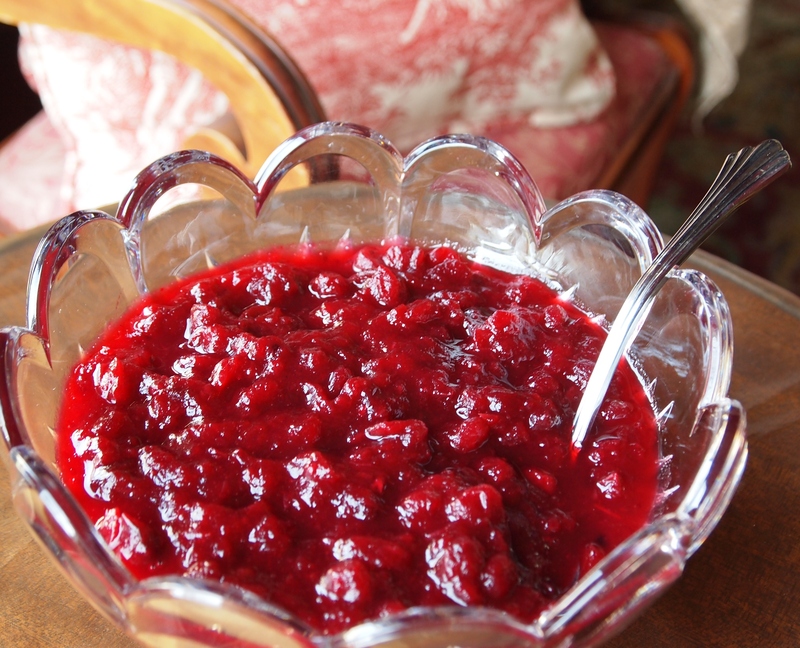 Even those of us who don’t particularly like cranberry sauce (me and my brother, John) thought it was fabulous – we all decided it’s a “keeper”. Enjoy! Aunt Suzy says . .
During strawberry season, Randy and I were at some friends talking about drinks made with strawberries. 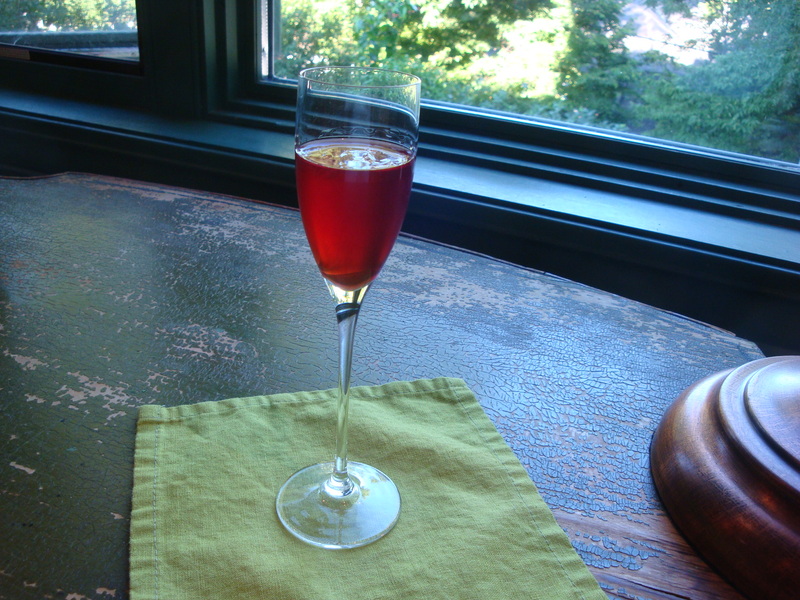 We discussed Homemade Strawberry Soda and Strawberry-Prosecco Muddle which put Randy in mind of this strawberry-infused Tequila, the name of which means Tequila for My Beloved. After doing some research, it appears a recipe for this was first published in 1939 in The Gentleman’s Companion (which you can purchase leather bound for a mere $499) by Charles H. Baker, and then again in Gourmet magazine in 1940. 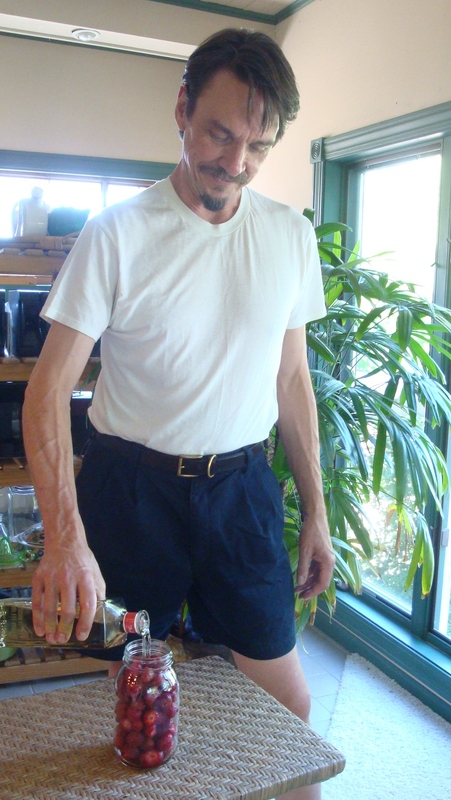 Randy recommends drinking this chilled straight-up in a liqueur glass. In my research, I saw many recommendations for drinking this over ice with lime and club soda. Using it in a Paloma was also recommended on several sites – this one sounds great to me because it uses grapefruit soda, which I love. (Addendum: It IS great!!) In any case, you will need some patience because it takes a few weeks to infuse, but I think well worth the wait. 1 quart sun-ripened strawberries, the more fragrant and juicy the better! Wash and hull the strawberries. Cut them in half and place in a quart jar. 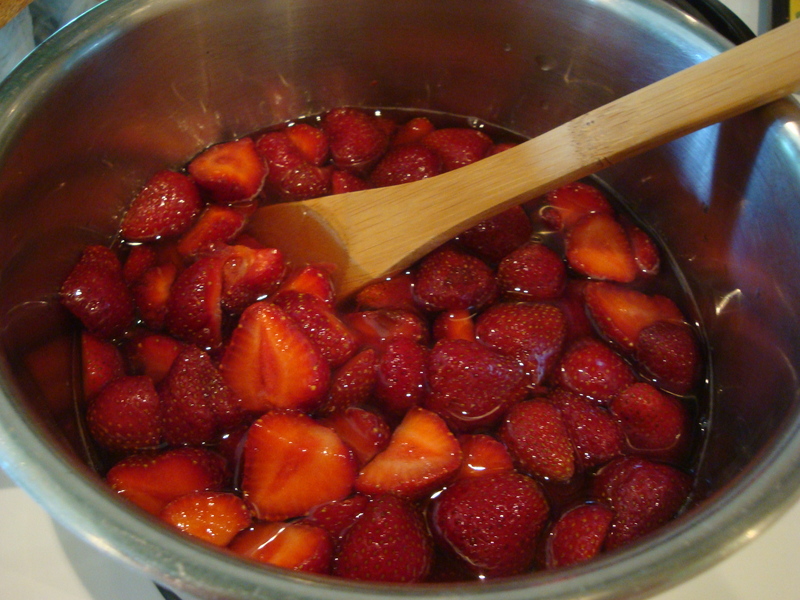 Pour Tequila over the strawberries to fill the jar, then seal tightly with the lid. Place in the refrigerator for 3-4 weeks. Drain the Tequila through a fine mesh strainer and put the beautiful pink liquid back in the jar or in a decorative bottle. Keep in the fridge or freezer. 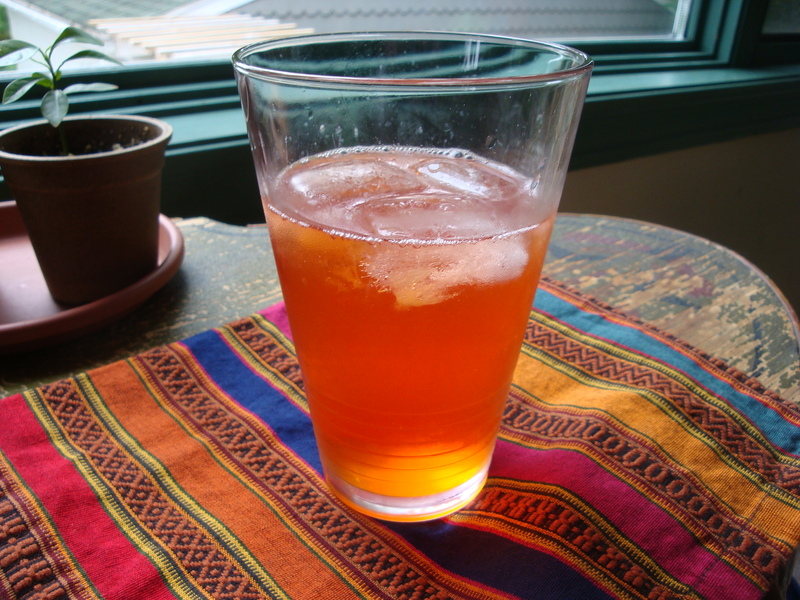 Science Project – Iced Tea! I am an iced tea fanatic, so my interest was piqued by the recent Harold McGee food science N Y Times article on the pros/cons of cold vs. hot brewing of coffee and tea. To add to the interest, readers were invited to ask questions, which Mr. McGee answered later in the week. Since I have branched out over the last few years from the classic Lipton iced tea I grew up with, this article about the best methods spurred my curiosity. True confessions, I went into this project fully biased toward the method I learned from my Mom – steep the tea bags in boiling water for a few minutes and then pour directly over ice while still hot. And no sugar please, but a squeeze of lemon is a refreshing addition. Since black tea turns bitter when refrigerated, I always make just enough to drink on the day it’s made. 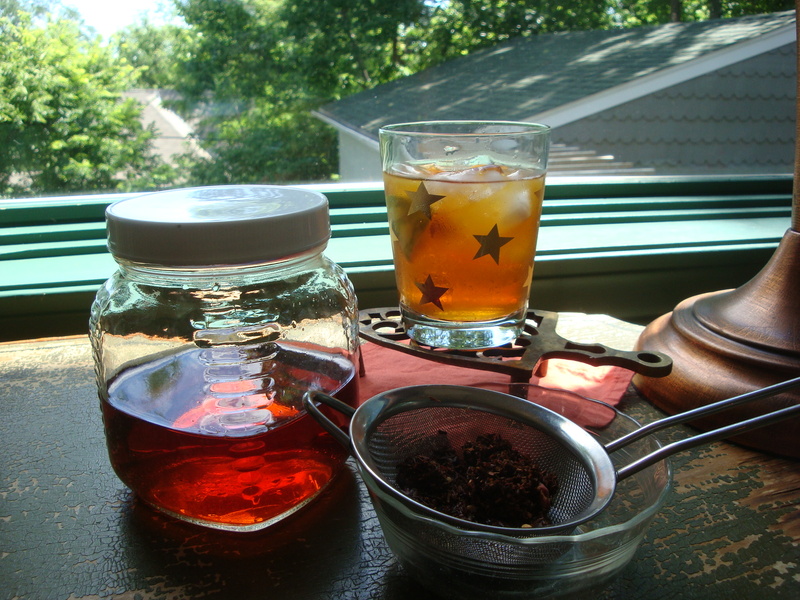 I’ve used these principles of hot-steeping for all the various types of iced teas and tisanes I make, adjusting the water temperature and steeping time accordingly. The NY Times article challenged my assumptions, hence my science project! Here’s how my experiment worked. 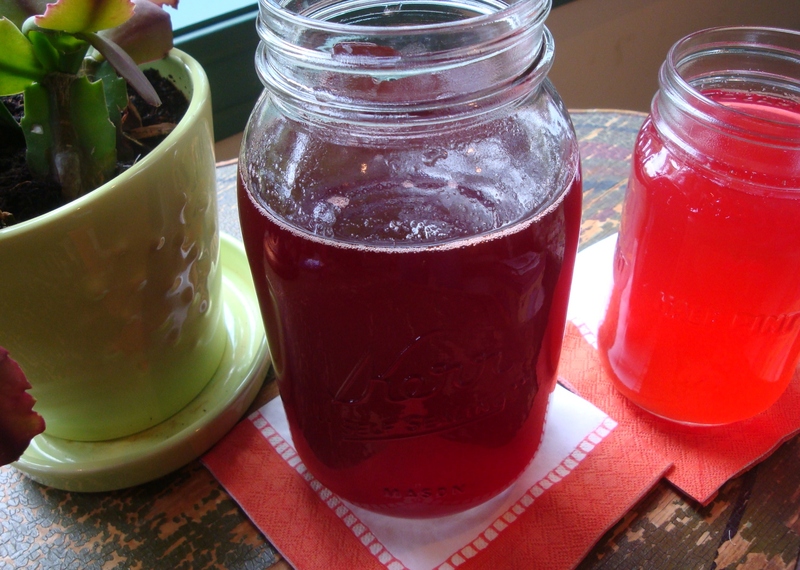 I cold-steeped and hot-steeped the main types of teas I drink iced – Green, Rooibos, Oolong, Hibiscus-Based Herbal and Black. I then compared outcomes and drew my conclusion. I had so much fun with this and learned a lot! I’d love to hear your thoughts and recommendations for iced tea types and methods. 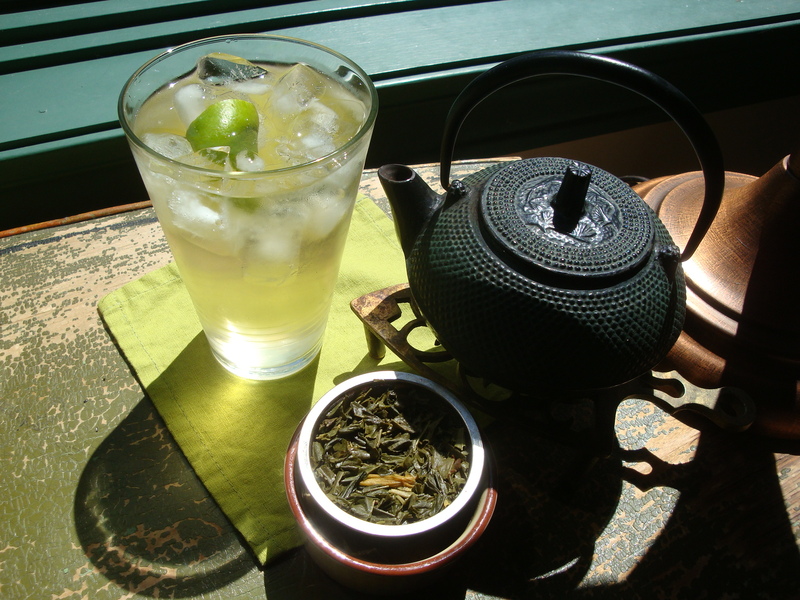 Traditionally, I have not been a green tea drinker – hot or iced. A few years ago, Green Tea with Mango was recommended when I was at Tea Source, and I was immediately hooked! I have also come to enjoy hot green tea, which I attribute to learning how important water temperature is to getting the perfect cup. I mainly like green blends for iced tea and always squeeze in a little lime. Tea Source’s Mandarin Orange Green is great, as is Gojiberry Green, a new offering from Back Porch Garden in Crystal River, Florida. I discovered Green Tropical from The Spice and Tea Exchange on my annual visit to Florida – it’s also a wow! Method 1 rounded teaspoon per 8-ounces room temp water steeped in a jar for at least 6 hours or overnight. I first learned about Rooibos a few years ago when I went to a local tea shop for help finding a tea that could be iced but didn’t contain caffeine. After a couple of cups of coffee in the morning, sometimes the additional caffeine of black iced tea causes me to levitate! 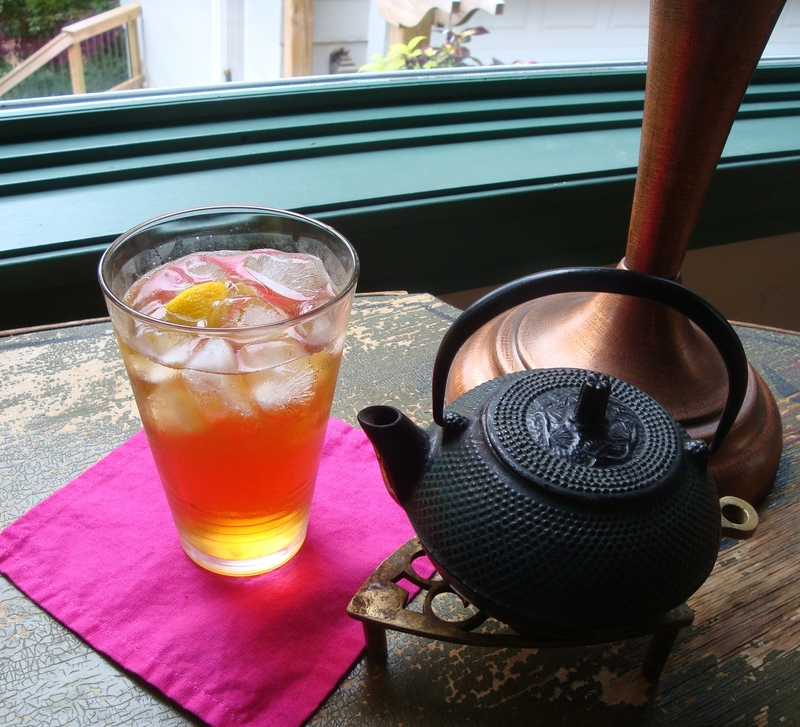 The folks at Societe du The recommended a rooibos blend with tropical notes called Cape Town. Tropical Rooibos blends have become a favorite! In addition to the Cape Town, I love the Rouge and Apricot-Ginger blends from Mrs Kelly’s Teas, and the Blood-Orange Smoothie from Spice and Tea Exchange is fab! Lemon or lime enhances the flavor. 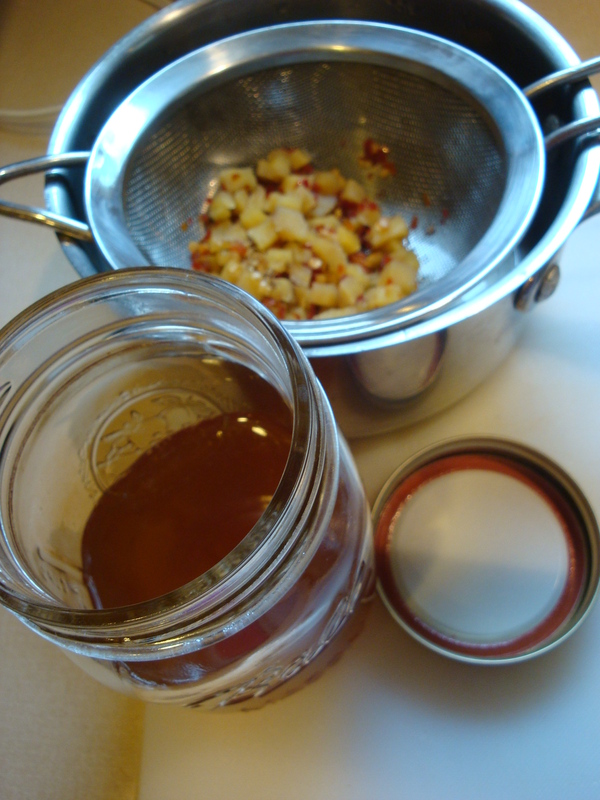 Method 1 rounded teaspoon per 8-ounces of room temp water steeped in a jar for at least 6 hours or overnight. 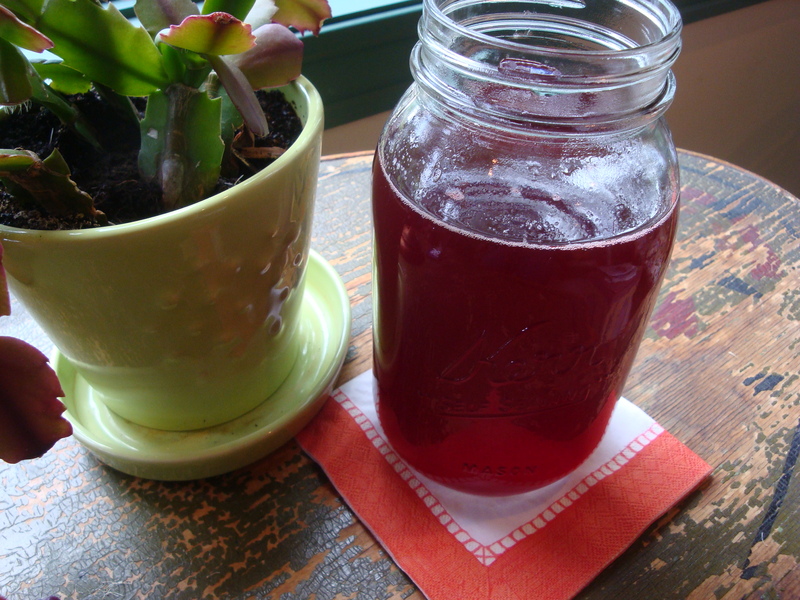 Conclusion: the cold-steeped made the best iced tea, although the hot method was not terrible. I don’t recommend making large quantities to refrigerate in either case. 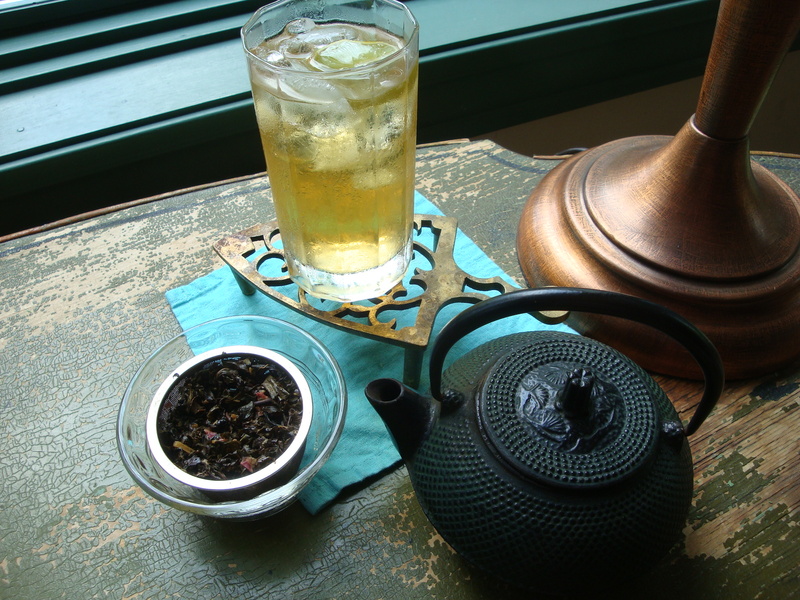 I would have never considered icing Oolong, but on a recent visit to Tea Source their Rhubarb Oolong blend was recommended for iced tea. Always game for a new iced tea experience, I tried it and really like it. Today I made an iced plain Oolong, Jade Poochong, and I can’t recommend it. Stick with the Rhubarb Oolong! The tea shown is Red Berries, a blend of hibiscus, dried grapes, citrus peel and flavors from Tea Source. While a regular summer drink here for a few years, I haven’t made it for a while – burnout, I think! I picked some up on a recent visit and was reminded of why I like it. I enjoy it plain with a squeeze of lime or lemon, although some feel it’s a little tart. 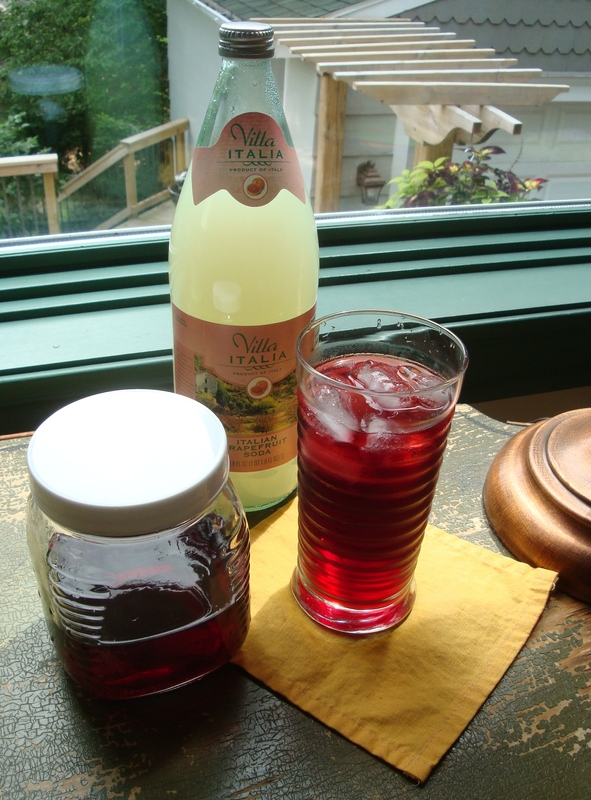 Rather than add sugar, I like to sweeten it up by mixing it with Italian carbonated sodas. With sparkling grapefruit, it tastes like a sophisticated Hawaiian Punch. Another hibiscus-based blend from Tea Source is Basket O’ Berries, also delicious and not quite as tart. Conclusion: Cold-steeped all the way! I think that black tea is what most of us think of when we think of iced tea. A lot of us grew up with Lipton or maybe another brand of tea bags used to make iced, with or without sugar. When I want good old straight-up iced tea, I still use Lipton tea bags, one per 8 ounces of water, hot brewed and served with a sprig of mint and a squeeze of lemon. But I really enjoy black tea blends. The one shown is Ginger-Apricot from Mrs. Kelly’s Teas. I also love Lady Londonderry from Back Porch Garden, Ginger-Peach from Bird of Paradise Tea, Cassis from Societe du The and many others too numerous to mention! Conclusion: I think the cold-steeped had the slight edge for black tea! This is the hardest to admit because it busts my preconceived notions, but admit it I must. Hot-steeped was a close second, so it will be my g0-to method when in a hurry. I am declaring this the summer of homemade sodas! It started with our post for homemade Spicy Ginger sodas. Since then, I’ve been on the lookout for sodas to make that can be good with or without alcohol. 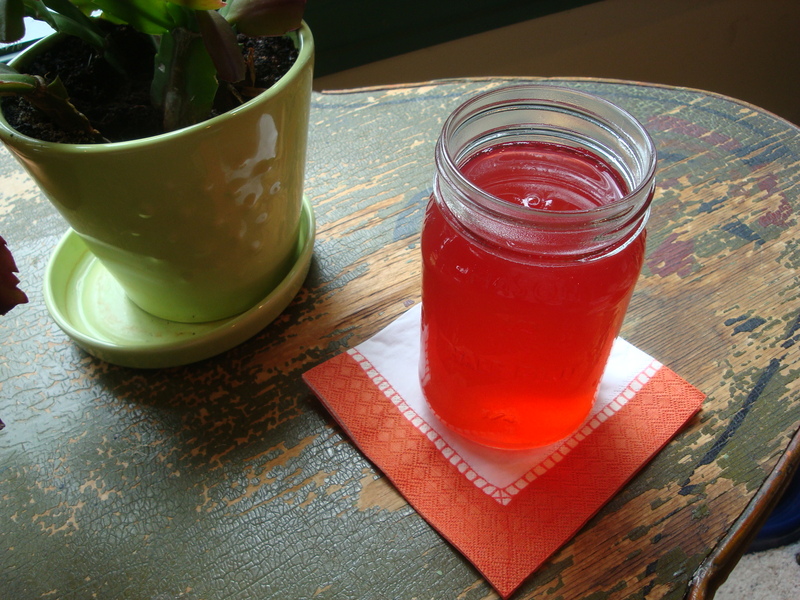 The rhubarb soda idea was posted by the Minneapolis Farmer’s Market recently when rhubarb was their featured “item of the week”. And just this week I bought a bunch of strawberries with another use in mind, but they were not very sweet due to the cool and rainy conditions of late. So I decided to search for a recipe for strawberry soda to use them up. 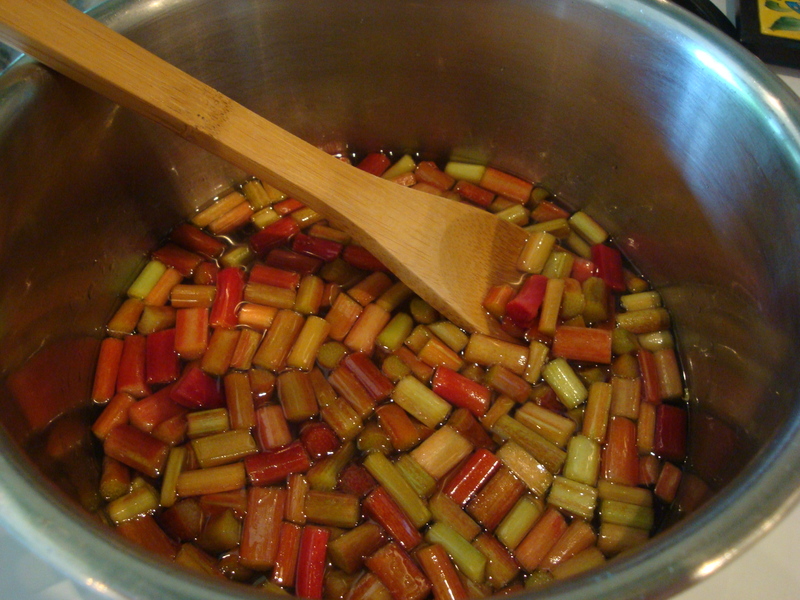 They are both delicious, but the rhubarb is my (current) favorite – it has a delicate and unusual flavor and a stunning color! Place all ingredients, except vodka, in a saucepan. Bring to a boil, stirring constantly. Turn down the heat and simmer about 15 minutes. Strain out the fruit using a fine mesh strainer. Pour into a jar and add the vodka once the syrup cools. (I read yesterday that adding a little vodka will stretch the refrigerator shelf life of the simple syrup to 3 months.) These quantities make 2 cups of syrup. So pretty! 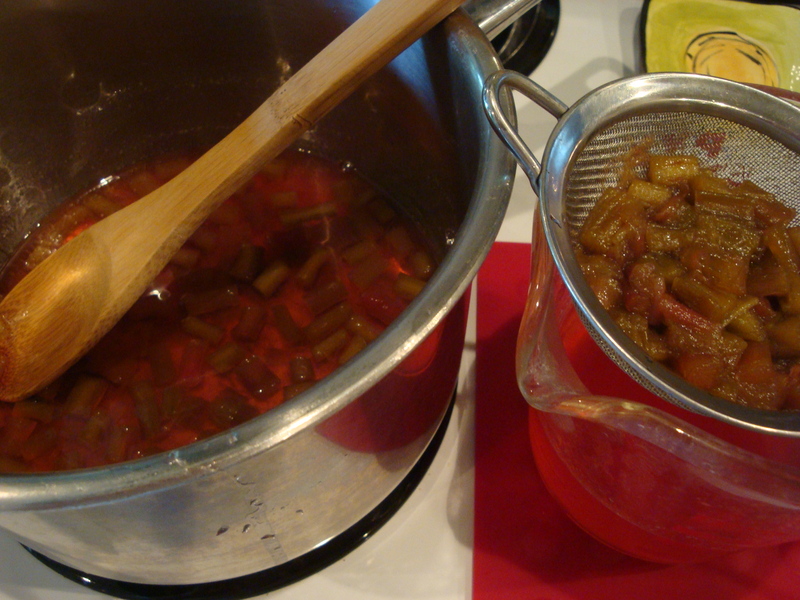 I used 3 tablespoons of the rhubarb syrup with 12 ounces of sparkling water. You can play around with proportions to get to your desired sweetness. I tried it with and without a squeeze of lime – delicious both ways. For a cocktail, I will add vodka and serve on the rocks with a twist of lemon or lime. Place all ingredients, except vodka, in a saucepan. Use a muddler or potato masher to press the berries to release some of their juice. Bring to a boil, stirring constantly. Turn down the heat and simmer about 10 minutes. Strain out the fruit using a fine mesh strainer. Pour into a jar and add the vodka once the syrup cools. (I read yesterday that adding a little vodka will stretch the refrigerator shelf life of the simple syrup to 3 months.) These quantities make 3 1/2 cups of syrup. Also pretty! 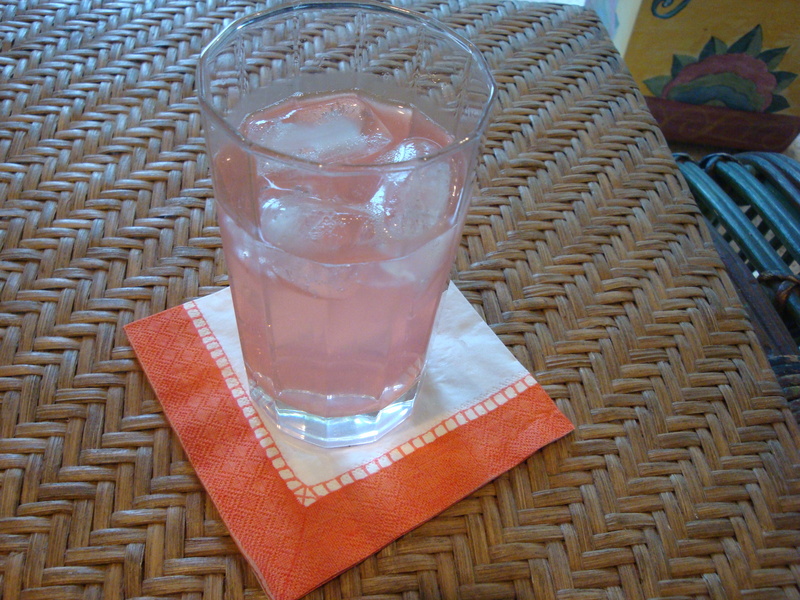 I used 3 tablespoons of the strawberry syrup and juice of half a lemon with 12 ounces of sparkling water. I also tried this without the lemon – also good, but I preferred it with the lemon. You can play around with proportions to get to your desired sweetness. For a cocktail, I will add vodka to the strawberry-lemon concoction and serve on the rocks. I think the strawberry would also lend itself to herbs like mint and basil. Many possibilities! This delicious drink is part of an article in this month’s Bon Appetit on making your own sodas. My friend Tamzan made it for me when I was over at her place for lunch recently and we both went “Wow”! These recipes were all without alcohol, but we began to speculate what kind of booze would work well. The next day I saw this video from a fellow Minnesota food blogger in which he added vodka. 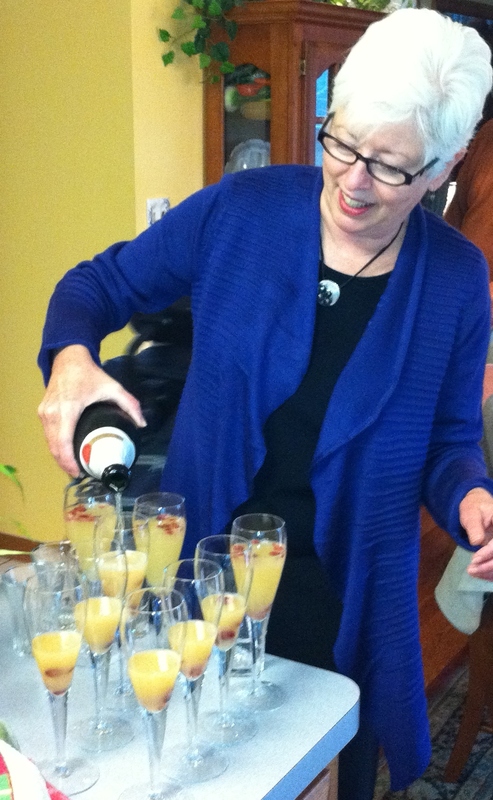 I served this drink (with vodka) to my book club last night, and we all agreed that it was delicious and refreshing! I served it without alcohol at a family gathering for Mother’s Day the following week. The good news is that it is equally delicious with or without alcohol! I think we need to come up with a name for the drink when served with vodka – any ideas? You’ll note that it starts with making a simple syrup which needs about an hour or so, so leave yourself time. This recipe makes enough syrup for about 9 drinks – more than specified in the Bon Appetit article. We made spicy rum chillers with it, and it was delicious!! Just add a shot of rum and a lime wedge to the basic drink recipe below. It’s perfect for summer! Bring to a boil then reduce heat to medium and simmer for 15 minutes. Remove from heat and let sit for 30 minutes. 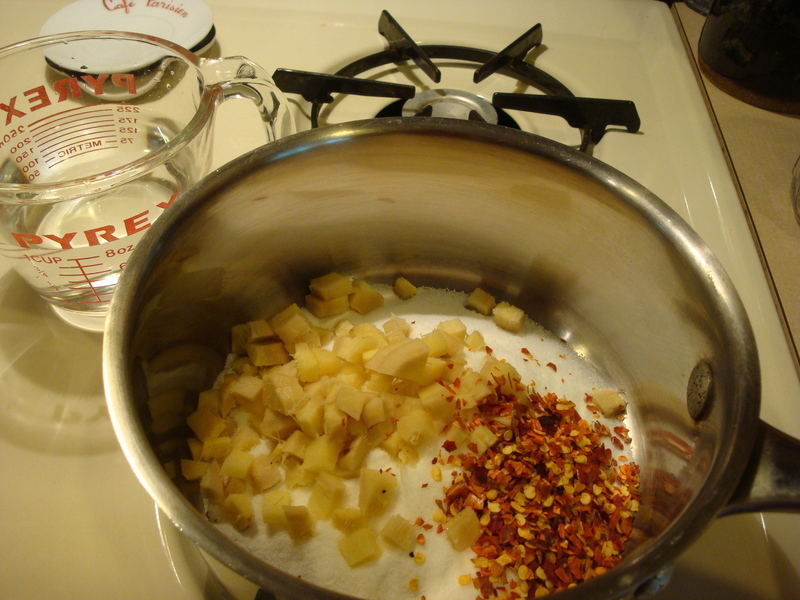 Strain the liquid into a jar and discard the ginger/chili pepper solids. Place ice in a 12-ounce glass. Add 2 tablespoons of the ginger syrup and juice from a wedge of lime. Add soda or sparkling mineral water to fill the glass and stir. If serving with vodka (or rum or tequilla), leave enough room. Add liquor to your taste – I used a little less than a shot. Nutritional Smoothie That Your Toddler Will Like! As I’ve mentioned before, I have a little boy, Desmond, who is now 21 months old. He and I go to a monthly attachment parenting meeting at Be By Baby, a Chicago baby store that you should really check out if you live in the area! Our last meeting was about family nutrition, and many of the mothers brought up the concern that they have about their toddler not eating anything more than Goldfish crackers and Cheerios. A lot of moms had really great ideas for getting your toddler to eat better foods, which was really nice for me as well because we just went through a few days of Desi not eating anything but…you guessed it…Goldfish. One of the things we talked about at our meeting was the use of flax seed. Flax seed has a ton of nutrients in it, and is great because you can add flax seed meal to things and your little one won’t even notice. One of the moms in my group suggested making a smoothie with flax seed in it, so I came up with this one for Desi. He absolutely loves it! Pulse the yogurt, banana and berries in a blender a few times until the fruit has broken up a bit, then puree it on high for about 30 seconds. Add the flax seed meal and a little juice, puree for another 30 seconds or so until smooth. Add juice as needed and blend. I serve the smoothie to Desi in a small cup with a straw, but if your little one isn’t using a straw yet, I recommend buying one of the “First Years Take N’ Toss” sippy cups (Target has them), or some other cheap sippy cup, and cutting off the end of the spout so that the thicker liquid can come through. You can save the smoothie for a day, so I make two and save the extra for the next day so that I’m not getting the blender out every day. It’s good on hot cereal…Desi doesn’t even notice that I’ve been putting it on his oatmeal in the morning. You can add it to baked goods like pancakes, muffins, or quick breads. Just mix a couple of tablespoons in with the dry ingredients. Add it to your granola if you make your own like I do (yes, I’m a serious hippie sometimes).